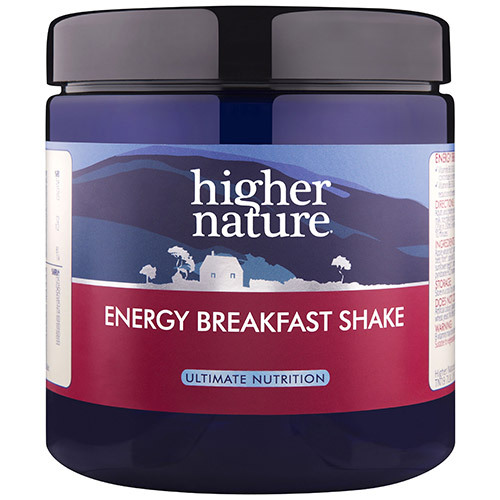 Higher Nature`s Energy Breakfast Shake is a whole food blend with B complex vitamins and vitamin C. Energy Breakfast Shake is high in fibre and low in fat, providing complex carbohydrates for slow energy release and is a great way to start the day. Tasty, with tangy Cranberry and blue-green Spirulina. This shake provides B Complex vitamins to help optimise energy levels and Vitamin C, a powerful antioxidant, which slows the ageing process and supports the immune system. Energy Breakfast Shake is high in fibre and low in fat. It also provides complex carbohydrates for slow energy release through the morning and is flavoured and sweetened with whole apples. CONTAINS NO additives, fillers, binders, salt, soya, wheat, gluten, yeast, lactose, dairy or other animal products, artificial preservatives, colours or flavourings. Apple whole fruit*, potato maltodextrin, organic ground quinoa, rice protein*, sugar beet fibre*, spirulina*, apple pectin (sugar)*, sesame seeds*, pumpkin seeds*, sunflower seeds*, cranberry extract, ascorbic acid, calcium pantothenate, nicotinamide, pyridoxine HCl, thiamine HCl, riboflavin, folic acid, biotin, cyanocobalamin. Adults and children over 12 years blend 2¼ scoops (30g) in 300ml skimmed milk, soya milk, rice milk or fruit juice, with a piece of fruit if desired [children 7-11 years 1½ scoops (20g) in 200ml, 3-6 years ¾ of a scoop (10g) in 100ml]. For best results, drink within 10 minutes. Below are reviews of Energy Breakfast Shake - 270g Powder by bodykind customers. If you have tried this product we'd love to hear what you think so please leave a review.